In Friday nights Eastern Conference Semifinal Game 1, between the Montreal Canadiens and Tampa Bay Lightning there was a controversial call that led to the game winner in double overtime for the Lightning. With 18:06 left in double overtime, Lightning center, Brian Boyle, carried the puck into the offensive zone, as he entered the zone replays showed that his teammate Valterri Filppula was slightly offsides, but there was no call made. Twelve seconds later, Nikita Kucherov scored the game winner and just like that Game 1 of this Eastern Conference Semifinal was over. Although the game was over, the talk over the controversial call was not. In his post game interview, Canadiens coach Michel Therrien was very frustrated over the none call made by the line judge, and blamed the officials for the loss. This has gotten me thinking about the idea of expanded instant replay, and a coach’s challenge in the NHL. As of right now the only replays in the NHL are on goal calls and all replay requests come from Toronto, where replay officials are sitting reviewing every goal. Areas where I see replay could be expanded and a coach’s challenge could be implemented are on plays like delay of game, icing, and offsides. All of the replays would be done in Toronto just as before. Although almost all penalties are judgement calls, delay of game is one that is very black and white. The rule states that if a player clears the puck from his own defensive zone and it exits the ice over the tall glass, this does not include the benches, without deflecting off of anything else, it is a two minute penalty for delay of game. 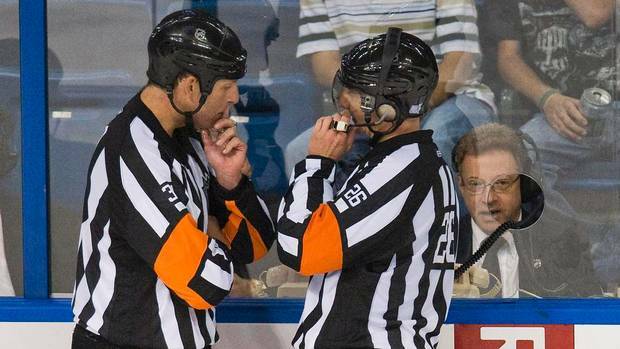 This call has been missed before in NHL games, although it is rarely missed. Often times it is hard to see if the puck has deflecting off of an opponent’s stick. This would be an easy call to review and could prevent a player from getting a penalty he does not deserve. Before the 2013-2014 NHL season, the league changed its rule from a touch icing system to a hybrid icing system to prevent injuries near the boards while trying to touch up the puck. Under the new rule, which ever player wins a race to the face off dots closest to the puck determines icing. If a player on the team that cleared the puck wins the race to the dots, play continues and no icing is called. If a player on the opposing team wins the race to the dots, icing is called and a face off is taken down at the other end of the ice, with the team that iced the puck unable to make any line changes. Under the coach’s challenge I would like to see implemented if icing is called, and the coach on the team that iced the puck believed that his player won the race to the dot he could call for a challenge. This would be a quick challenge to see which player won the race. If the call is reversed, my idea would be for the team that won the challenge to get a face off in the offensive zone since that is where they would have had the puck had icing not been called. In the NHL, the puck has to enter the offensive zone before any other player enters the zone. If a player is in the offensive zone before the puck it results in offsides. One way, that a challenge could be implemented on offsides is at the next whistle if the play ends up in a goal as it did in Game 1 between the Canadiens and Lightning, the defending team that just allowed the goal could challenge. If the referee sees in the replay that they were offsides, they would call off the goal and have a neutral zone face off just as if offsides was called in the first place. I would like to see the NHL give this expanded replay and coach’s challenge a trail run in the future during preseason games to see how it works. In the past few years we have seen the MLB start with just home run reviews and then expand it to safe and out calls on coach’s challenges, soccer has also implemented goal line technology, the NBA has reviews in the last two minutes of games on out of bounds calls, and the NFL has had coach’s challenges for over 15 years now. So again I would like to see the NHL give the coach’s challenge a try, give each coach one challenge per game during the preseason next year and see how it works out. None of these challenges should take longer than a minute or two, so it wont hurt the rhythm of an NHL Game. This entry was posted in Hockey, Home, National and tagged Montreal Canadians, NHL, Nikita Kucherov, Tampa Bay Lightening.